The ethereum-based token maker (MKR) is outperforming the broader markets with a 37 percent gain so far in February. Ranked 16th by market capitalization on CoinMarketCap, 1 MKR was valued at 4.6 ETH on Feb. 14 – the highest level since Oct. 8 – and was last valued at 4.37 ETH. The pullback is likely associated with profit-taking following a jump to 129-day highs. MakerDAO is a smart contract platform on the ethereum blockchain, backing the value of DAI (DAI) – it’s native stablecoin, which is backed by ether and is soft-pegged to 1 USD – through a system of Collateralized Debt Positions (CDP). This loan payment system uses ethereum’s ether (ETH) token as collateral, necessary for the governance of DAI throughout the Maker ecosystem. Currently down 5.39 percent from its recent peak, MKR has still excelled over the month as it continued higher than the previous month’s peaks, a sign that the bearish market structure is beginning to falter. Maker tokens are created or destroyed depending upon certain price fluctuations of the DAI coin in order to keep it as close to $1 USD as possible. The platform has been incredibly successful throughout the crypto bear market, with about 2 percent of all Ethereum now locked in MakerDAO loans. 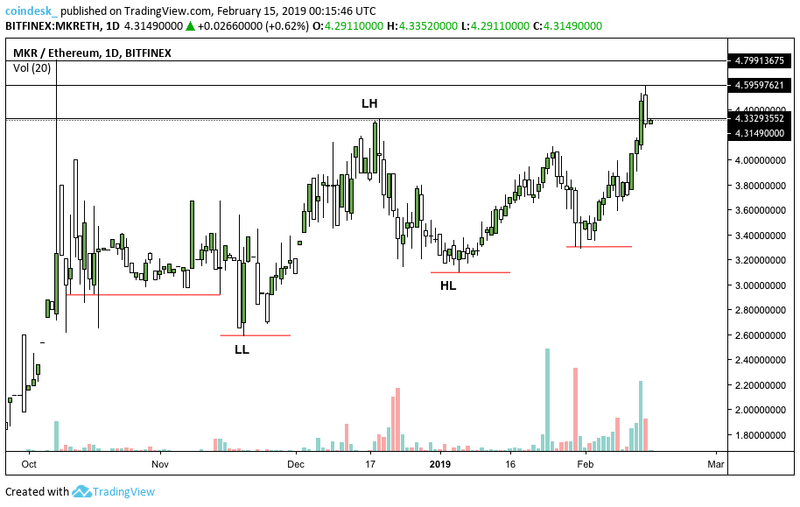 The chart above demonstrates rampant fluctuations in MKR’s price since before the new year began, with a recent higher-high trend taking shape and the 2019 candles printing larger bodies as greater liquidity flows to the market. As part of the system, users pool their ether together automatically and receive DAI. 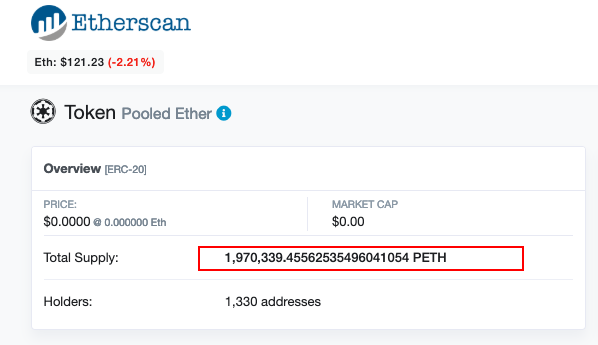 As of now, a total of 1,970,339.45 ETH are locked up in the primary Maker contract, representing roughly 1.87 percent of all 104,862,328 ETH in circulation – significantly higher than 1 percent seen in November. DAI tends to be overcollateralized reportedly by more than 200 percent. So, for every DAI created, there is at least $2 to $3 worth of ETH stored in CDP. As a result, when ETH’s price drops, more of that cryptocurrency needs to be locked up in order to keep DAI collateralized. MKR tokens are also used to pay transaction fees on the Maker system and provide holders with voting rights within Maker’s ‘continuous approval voting system’. MakerDAO made the decision recently to increase its stability fee from 0.5 percent to 1 percent in order to reduce and smooth fluctuations in DAI’s price peg of the USD, a welcome move seen by many as a positive step toward greater economic assurances and stability from the team. Also of note Uniswap, an automated Ethereum exchange protocol overtook Ethfinex exchange this week as the number one venue for trading MKR/ETH, with over $329,000 in USD value traded over a 24-hour period. The exchange offers a reduced price tag, while other exchanges have MKR listed at a premium, paving the way for arbitrage trading between Ethfinex and Uniswap. Eventually over time that gap should begin to close its spread as buying on Uniswap and selling on Ethfinex will result in a price convergence in the long run, but for now, Maker has a chance to continue exceeding expectations.